I just wanted to say a thing or two about adventuring. For me adventures don't have to be far and wide. Sometimes just a little of the beaten track is all that's needed. Or even in the same old place, with eyes held open wide for treasure of course. 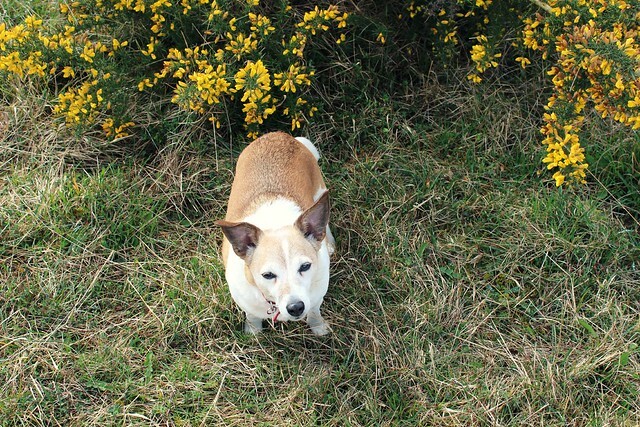 A band of merry mates is a good thing, but sometimes alone will do, or even with a little dog. New discoveries are the thing. The other day while walking on the common I dropped down the hill a little further than normal and discovered this lovely yellow gorse. I`ve only ever seen it at the coast so I was mighty pleased I wandered a bit further. Another thing that connects me to that wonderful place where the land meets the sea. 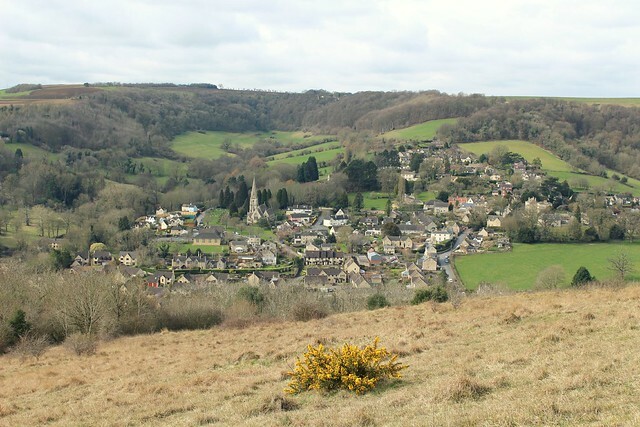 There it is on the slopes, with the little town of Woodchester below. Sometimes I'm quite sure I might be living in one of those Hornby railway sets with the hills and the houses and the church. I think if you press a button there might be the toot and a train might come winding through the hills! The chimes of the church and the sounds of the children playing outside at break time carry on up here in the breeze. There she is, my merry mate! Always willing to be in the shot. I found a red pencil! And did I find treasure? you bet I did....I found a red pencil! Just a bit further up. I took it as a sign, I take everything as a sign. Well the good things anyway. 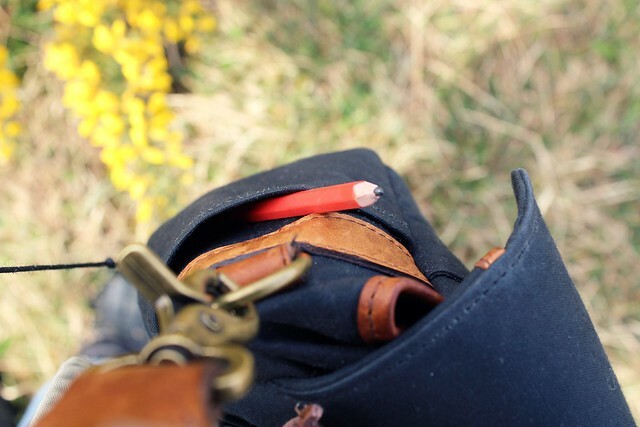 I think every adventurer/photographer should have a red pencil in their bag. To make handy notes and things you know. 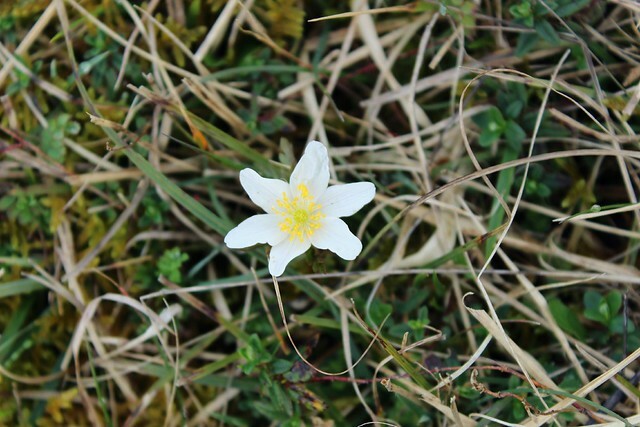 And while having a `Sound of Music' moment, I thought I might have found an Edelweiss. But that would apparently require travelling a bit further a field. I was duly informed by two people I found peering very closely that it was actually a Wood Anemone. So there you go. Urban girl traverses the Cotswold Hills! Oh the view of that town! You're right - it looks like a scene from Thomas the Train or Postman Pat! Your dog is the perfect companion for your little "adventures.' We just got a dog and now I never feel lonely on my little walks either. And I'm walking for longer amounts now too. Thanks for sharing these pics! Love love love this post. Lots of goarse where I go hiking! Isn't it gorgeous. Love that you found a pencil, and no less... red. 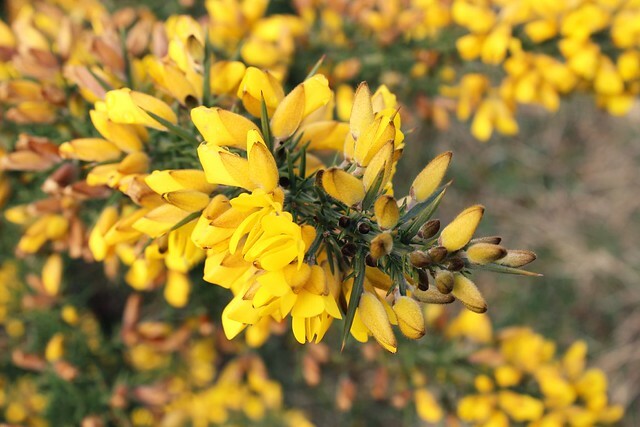 Gorse blossom always reminds me of Northern Ireland where it blooms in abundance at Easter. I vaguely remember using gorse it to colour hard boiled eggs which we would then decorate and roll. Our local woods were full of wood anemones when we strolled through last weekend :) They are called "bed wetters" in our local Swiss dialect, though I've never found out why…?! That view of Woodchester is the epitome of England!! Love it.